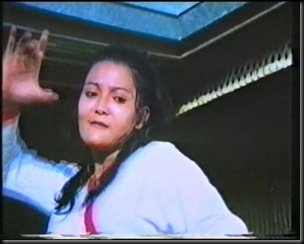 After a small village is attacked by a gang of vicious bandits, one of the village women, Rosa, is saved by mysterious martial arts master Ming, who offers to teach the men of the village the art of unarmed combat. Initially sceptical, Ming soon persuades them by punching a few of them and tossing them around a little. As they train themselves to fight, however, the bandits are scheming to return to their village and plunder it once more. Ming gives the men of the village some medallions - symbols of their loyalty, righteousness, and transformation into a fully-trained fighting force - and makes them promise never to use their skills for evil or revenge. And sure enough, when the bandits return, they get a severe beating and run crying back to the chief goon. "We'll kill the men, women and children. They will all pay for this," he vows. Although armed with huge machetes, the bandits are no match for the villagers, and even Palito gets in on a little monkey-style kung fu action. However, the villagers break their vow and, egged on by head villager Nardo, kill off the remaining bandits, despite Ming's protests, with only good-guy Lewel refraining from the bloodshed. "He was an enemy, yes. But he could no longer fight you. He was begging you to spare his life," moralises Rosa. 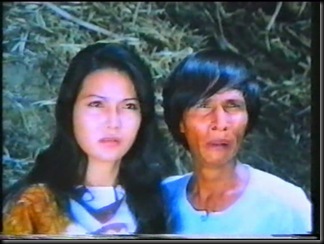 When the villagers return home that evening, flushed with victory and booze, Nardo attempts to drag Rosa away and have his wicked way with her. 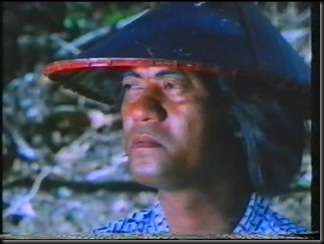 After Ming beats up the unruly mob, Nardo sneaks up behind him and stabs him in the back with a machete. 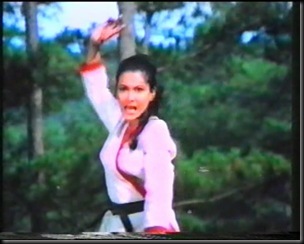 Ming dies with a warning on his lips: "This evil thing is just the beginning..."
With Palito looking on and wincing from time to time, Rosa begins training herself to avenge Ming's death, including some King Boxer-style iron palm training, and the classic 'mediating under a waterfall' bit that no martial arts training montage is truly complete without. Meanwhile, Nardo and his gang invade a house in the woods and relieve it of all its money and valuables; it has an armed guard, so they were probably ill-gotten gains anyway. They then hijack a bus, which seems less justifiable, as it doesn't seem to be full of drug dealers or anything. Clad in black uniforms, they are now known and feared as 'The Black Gang'. Lewel, who is now a policeman, and Rudy (who I don't remember being in the film before, but the film itself seems to think otherwise, so who am I to argue) meet Rosa and Palito in the woods and get down to some light exposition. It seems that Nardo's gang has recently incorporated some other band of goons, and that Lewel has been charged with the task of tracking them down in Bicol. Rosa offers to come with, but Lewel tells her it's too dangerous. Exposition over. Lewel and Rudy find members of Nardo's gang in the woods and try to take them in, but they put up a big stinker of a fight, and both Rudy and Lewel are wounded. 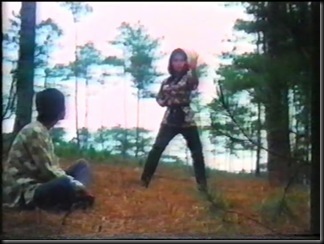 Rosa shows up in the nick of time, though, and beats Nardo's man into the ground in the film's most exciting and sustained fight scene so far. Just as she's about to deliver the fatal blow, Lewel reminds her that killing goons just isn't cricket, so she makes do with taking his medallion from him. 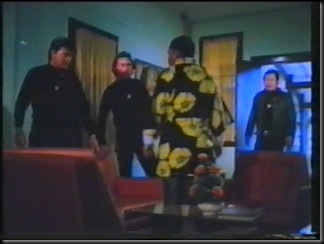 One interesting thing about this film is that the villains which our heroine is forced to confront are the same people who, in the start, were themselves the helpless victims of rapacious bullies; not exactly standard fare for a martial arts revenge picture, although you can see a similar thing going on in Tyrone Hsu's 'The Assignment'. 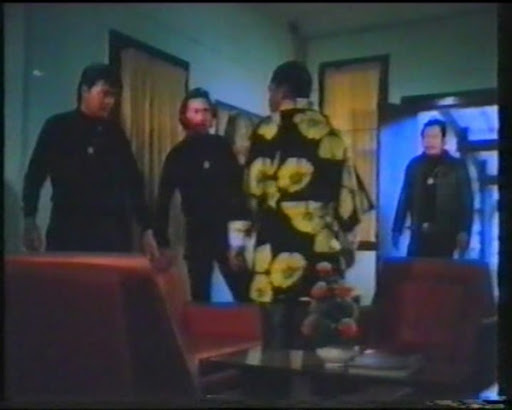 Nardo's gang even wear the medallions given to them by Ming, highlighted by their black outfits, which seems a deliberate mockery of Ming's values and a twisted inversion of everything he tried to teach them. The fight scenes aren't as well-conceived or as crisply executed as they are in their Hong Kong counterparts; in the first half of the film, before Rosa joins in the fray, all the fights are big rollicking stuntmen brawls, but they're good fun nevertheless. 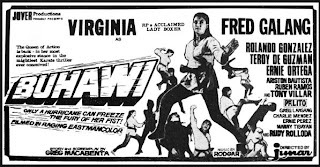 Once Rosa gets her fu on, however, the fight scenes improve by several hundred percent, as Virginia, an experienced action star, brings not only a practiced athleticism to her fights, but also a kind of intensity bordering sometimes on desperation. Her hunger for revenge is palpable, and her frustration at being denied the satisfaction of killing is quite persuasive. 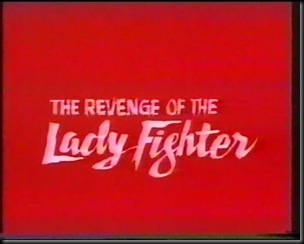 'Revenge of a Lady Fighter' doesn't seem to be the original title; the Hong Kong distributors, M/S Mirabelle International, have clearly added the red title cards (the first of which reads 'Revenge of Lady Fighter', while the second more accurately reads 'The Revenge of the Lady Fighter') to the title sequence, so it's not clear yet what the original title was. None of the films listed in the available information online seem to match, and the only review I can find is a disapproving little squib in German. Even the year of release is no better than an educated guess. Another curiosity we can probably thank the HK distributors for is that the film opens with a scene that occurs chronologically much later in the film. 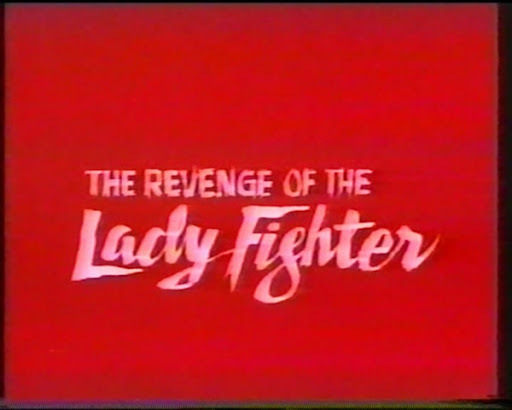 This is presumably to get the attention of the audience and reassure them that there will, in fact, be a lady fighter somewhere in the film, and that in the course of the running time, she will exact a certain amount of revenge. 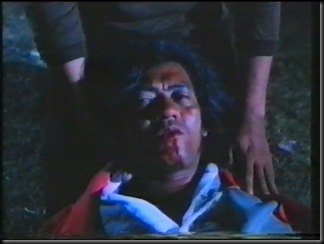 This counter-intuitive technique of hooking the audience with footage taken from the last third of the film was much loved by Sandy Frank, who distributed a lot of of Toho and Daiei monster films in the sixties and seventies. 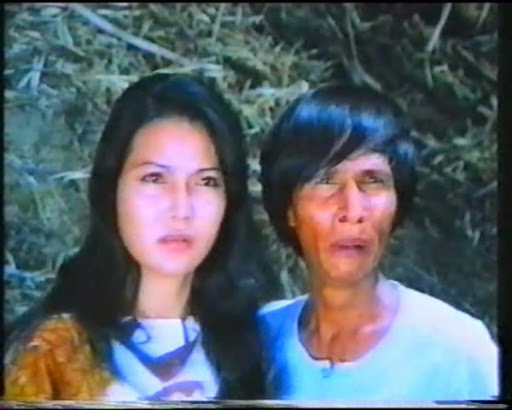 Directed by 'Junar' (Jun Aristorenas) and starring his wife Virginia, 'The Revenge of the Lady Fighter' is a thoroughly entertaining film, and a surprisingly obscure one. 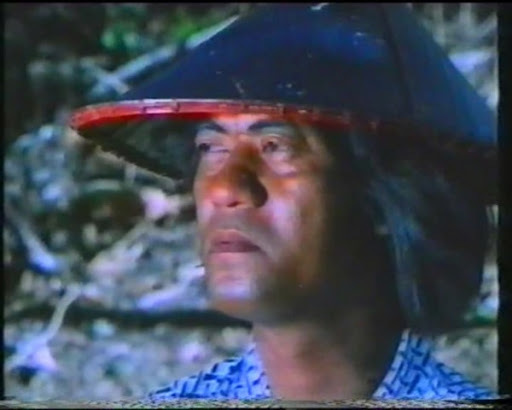 Despite the arguably regional bursts of humour from Palito (and another comic actor I haven't identified), this is a supremely exportable film which could have played anywhere there was an audience for martial arts revenge films. Incredibly (considering this is the husband-and-wife team behind 'Batwoman and Robin Meet the Queen of the Vampires'), there are no wild leaps of improbability or savage assaults on credulity, there are no eyesores of low production value, and even the dubbing, although heavily accented, is intelligible and rarely silly (although I did smile somewhat when the police chief told Rosa "I am clothing you in the authority of the law"). So it's hard to imagine why even among fans of kung fu films this is a practically unknown film, as it's a solid pleasure to watch.